The standing triple jump is an easy to administer test of explosive leg power. The standing triple jump test is based on the athletics triple jump event, though without an approach run. The standing triple jump was also once an event at the Olympic Games in 1900 and 1904, and is also an event in Sports Hall competitions in the UK. The standing TJ is now used commonly in the training for the jumps events, and is part of the jumps decathlon fitness assessment. equipment required: tape measure to measure distance jumped, non-slip surface for the approach, and soft sand landing area (preferred). pre-test: Explain the test procedures to the subject. Perform screening of health risks and obtain informed consent. Prepare forms and record basic information such as age, height, body weight, gender and test conditions. Check and calibrate equipment if required. Perform a standard warm-up. The take off line should be clearly marked, at an appropriate distance from the landing area based on the skill level of the athlete. See more details of pre-test procedures. procedure: The starting position is with one foot ahead of the other, with rocking of the body allowed. When ready, the athlete leaps forwards off the front leg, landing on the same leg (the hop), then in a continuous movement leaps forward to step onto the opposite leg (the step), then takes off this leg to jump into the landing pit, landing on both feet (the jump). Vigorous swinging of the arms and driving the knees are encouraged to provide maximal forward drive and jump distance. Three attempts are allowed. scoring: The measurement is taken from the take-off line to the nearest point of contact on the landing (back of the heels). If they fall backwards, the point of contact closest to the take-off is measured. Record the longest distance jumped, the best of three attempts. The Olympic record for this event is 10.58m set by Ray Ewry (USA) in 1900. Anything over 10m is excellent, 11m is elite. A long jump sand-filled landing pit is sometimes used for the landing instead of a hard surface, which enables the subject to confidently put more effort into the jump, and to extend the legs further in front of the body for landing. This technique also allows those with greater skill to score longer jumps, which is undesirable if you are trying to test for leg power only. Generally longer distances should be achieved with this technique. disadvantages: there is some skill component in this test. comments: Falling or stepping backward after the landing will result in measurement to that point of contact rather than where the feet first touched the landing pit. 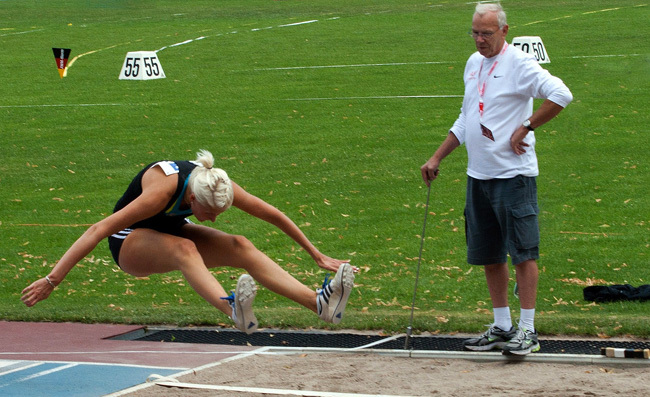 a similar test of leg power is the standing long jump. The Jumps Decathlon - 10 events for assessing speed and power, including the standing triple jump. The Standing Triple Jump was an athletics event at the early Olympic Games. Use this calculator to convert cm to feet and inches.